External GNSS connections allows to utilise accurate location provided by high-quality GNSS receivers. In theory Mapit can be connected to any Bluetooth or TCP enabled device streaming the data using NMEA standard. If the device is capable of streaming RTK corrected coordinates you get get centimetre accuracy and all GNSS metadata statistics displayed and recorded by Mapit. On top of the standard (direct) connections via Bluetooth or TCP some GNSS receivers offer dedicated connections via apps like Trimble Mobile Manager, EOS Tools Pro or Leica Zeno Connect. These can be the source of the GNSS location for your Android device and feed the location manager via a so called “Mock location”. Mapit can also utilise Mock locations provided by any other apps like “Bluetooth GPS”, however some GNSS metadata may not always be available in that mode. Since version 6.0.0 Mapit GIS is able to use an innate dedicated NTRIP client which uses the RTKLIB engine to provide RTK corrected solutions. More information is available here. Direct External GNSS Connection via Bluetooth or TCP socket – this method of connection should be used if you want to connect Mapit directly to the source streaming NMEA sentences via the Bluetooth interface. If you want to get RTK corrected location via this method of connection you have to have a device which is able to stream NMEA with the solution applied. 2. In MapIt settings go to External GPS and switch ON the External GPS switch. 3. When getting back to map the location source will be automatically switched to External GPS (you may need to restart app on some devices). 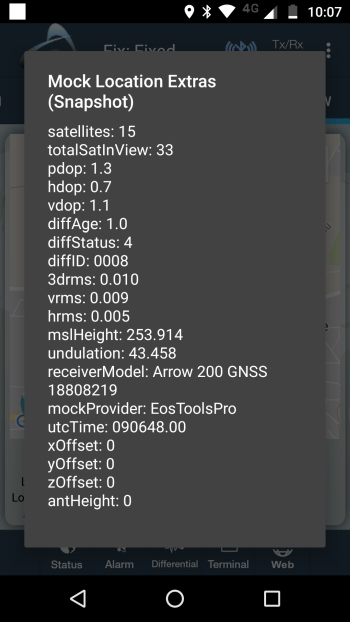 Eos Tools Pro Connection – Enable this function if you would like to make Mapit compatible with with Eos Arrow receivers. Eos Tools Pro must be installed and configured on your device before using Mapit GIS. These Tools feature an NTRIP client to receive corrections from an RTK network/Internet base station and feed these corrections to your Arrow receiver via Bluetooth. They will also take care of populating the Android Location Service with the Arrow’s more accurate position (replacing the device’s internal position with the Arrow’s position) – this position is then used by the Mapit app. 2. 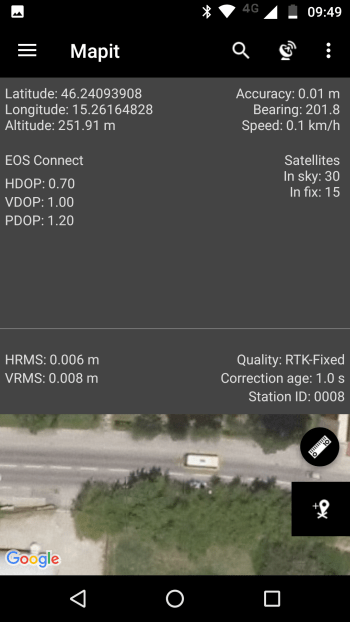 Connect your GNSS receiver via EOS Tools and enable Mock Location inside the EOS Tools Pro – make sure you are getting the RTK corrections correctly. 3. When you get accurate location in EOS Tools Pro – switch to Mapit and in the External GNSS Settings → EOS Connect on. 4. You can enable GNSS metadata for export in Survey settings as well if you need. 5. 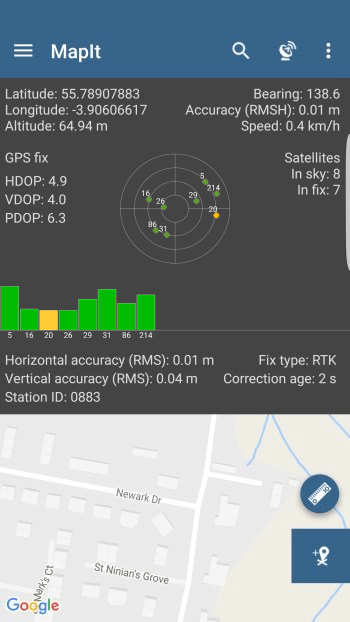 In this mode you will not get the satellite’s signal and satellite’s position views – as they are not available via mock location. Note: If you would like to get mean sea level height in Mapit – please enable Geoid height for GPS and select the relevant Geoid Grid from the list. 2. Connect your Leica Smart Antenna via Zeno Connect and enable Mock Location inside the app – make sure you are getting the RTK corrections correctly. 3. When you get accurate location in Zeno Connect – switch on Mapit and go to External GNSS Settings → Switch On Leica Zeno Connect switch. 2. Connect your Trimble Catalyst Antenna via Trimble Mobile Manager app and enable Mock Location inside the app – make sure you are getting the RTK corrections correctly. 3. When you get accurate location in TMM – switch on Mapit and go to External GNSS Settings → Switch ON Trimble TMM switch. 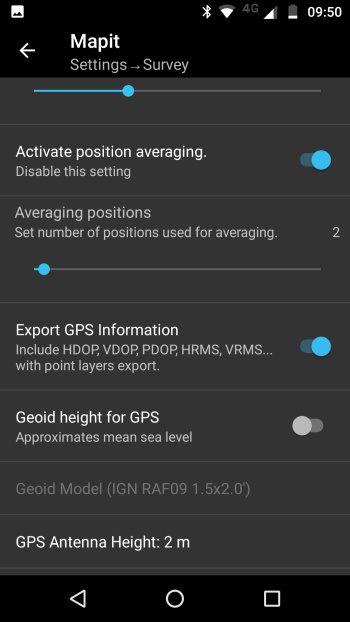 You can also use any other app providing Mock Locations like “Bluetooth GPS” to get the location inside Mapit → Leave External GNSS settings switched off in that case. GNSS metadata statistics like DOPs values, RMS values etc. however will not be available in that mode.